Welcome to Petoskey’s in Fremont. Seattle’s only Midwest Bar and Restaurant. From the people behind Zayda Buddy’s and Pomerol, Petoskey’s serves real Midwest Comfort Food in a super comfortable environment. Wood fired Minnesota Style Pizza, excellent hot dishes, deep-fried Wisconsin cheese curds, Walleye fish basket, bouja, and more great stuff. Petoskey’s features an excellent selection of beers and cocktails. Definitely try our Bloody Mary on weekends when we will feature all the Big Ten College games and of course the NFL’s NFC North Division on Sundays. Petoskey’s is home to the Vikings and the Lions as an ode to Mike Petoskey’s heritage (We think he leaned more purple and gold, but that has long been debated over many Grain Belts and Stroh’s). Of note: The Vikings did tame the Lions during the Vikings era (793-1066). We do have that Midwest Nice in us, so all you Midwest folk can come and feel welcome to watch your Packers and Bears too. Seahawks games will also be featured. NHL and MLB games from all Midwest teams will be televised. Come on in and feel happy. We welcome all who want a good meal and a nice beer or cocktail. Petoskey’s food and drinks are made by friendly cooks and served by friendly bartenders and servers. That’s what we do dontcha know. 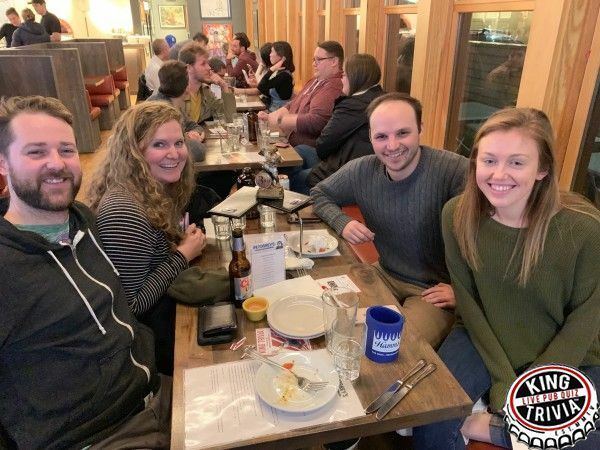 We had a raucous evening of trivia at Petoskey's this week. With 25 players across 6 teams, I actually had to mess with my pre-existing settings on the mix board to get enough output to overcome the din of background chatter. Quick apologies to those who were sitting in close proximity to my host desk as I'm sure the speakers were a bit too loud for you. And for those wondering about that enormous boom we heard midway through, that was Super Thunder according to the National Weather Service. Well, technically they described it in a way lamer scientific way so I'm sticking with super thunder. We had six teams competing for glory and prizes this Tuesday. Cornstache, LGBT BBQ, Gollum Gollum, Second Deck, as well as Future Industries and Cabbage Corp (who were here celebrating a friend's birthday, hope we all helped to make it a memorable night for you). It was quite a unusual night in terms of scoring too; we left Round 4 with no-one above 30 points, but by the end of the night we had 2 teams above 70 points! But enough spoilers, let's break down the contest round by round. Round 1 as always is our General Knowledge round where we sample questions from a potpourri of categories. Whether fond memories of childhood bedtime stories (Sam I Am is a character in what Dr. Suess book? Green Eggs and Ham), fond memories of tween mystery stories (Which Teen Detective returns to theaters investigating a Hidden Staircase? Nancy Drew), or fond memories of grown-up airplane novels (Which former congressmen wrote The Runaway Jury and The Firm? John Grisham), players were tested across a variety of...hey, wait a minute. Round 2 is our Picture Round, and this one was a traditional call-back to the superb Disney Vault of animated films with heart and soul as opposed to all the modern CGI-heavy cash-grab remakes they've been farting out. What, no, I'm not bitter about my fondness for my childhood memories, what would make you say that? Teams were tasked with identifying the actors behind the voices of comedic Disney characters like Mushu (Eddie Murphy), Kuzco (David Spade), and Terk (Rosie O'Donnell). It was a feast or famine situation for our teams; half of them were only able to hit 25% accuracy, while the other half managed to put up an average of 75% accuracy. Luckily for your host, his Disney-film hot take had some modicum of supporting evidence through Gollum Gollum's successful Double or Nothing for 16 points. And now for our score roundup. As you might have guessed, First Place was held by Gollum Gollum with 20 points. Second was taken by Cornstache at 12 points, while third place was orbiting Second Deck with 10 points. Fourth through sixth were respectively held by LGBT BBQ (9 points), Future Industries (5 points), and Cabbage Corp (4 points). The fun continued in our Theme Round 3 titled: Flip Flops Are Cool. If you're wondering what the heck that actually meant in terms of game-play mechanics, let me translate. Every question or answer in this round involved either gymnastics or box-office bombs, whether it was knowing the first gymnast to adorn a Wheaties box (Mary Lou Retton), the misleadingly named non-equestrian gymnastic apparatus (Pommel Horse), or the disastrous Affleck/Lopez combo film (Gigli). The fun quotient was completely disproportionate this round as well; three teams struggled hard to put up an average of only 25% accuracy, while Cornstache and Second Deck both managed to Double or Nothing for 12 points. It's a tough job to be the question-writer balancing difficulty with results like that, good thing I just have to read them. And for those readers who remember my rambling at the beginning, you know that the situation didn't improve for our contestants in our Guess Who? Round 4. Over half our teams jumped the gun on our 10 point clue that revealed our actress had her film debut in Buffy the Vampire Slayer, and all save one incorrectly identified our mystery woman as Kristy Swanson. Although perhaps best known for that role, Swanson had actually been featured in a variety of films before that point, such as Ferris Bueller's Day Off, Hot Shots! and Pretty In Pink. No, we were looking for a much more well-known and accomplished actress. But despite our increasingly specific clues, only Future Industries managed to identify the Oscar winning Hillary Swank (and after our 10-point clue to boot). With nearly everyone losing a point off the backs of that miscalculation, we found our team scores on the, hmm, shall we say... lower end of the spectrum? The battle for first was a tight competition between Gollum Gollum (24 points), Cornstache (23 points), and Second Deck (21 points). Future Industries held the middle ground at 17 points, while LGBT BBQ (9 points) and Cabbage Corp (6 points) were still getting warmed up. 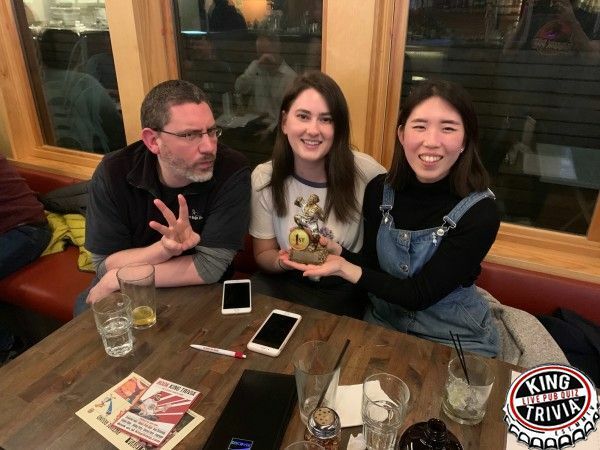 That's the luck of the draw in trivia, you'll get a string of weeks with categories you know like the back of your hand, and sometimes you'll get questions about things that you didn't even know existed. But the night is always darkest before dawn, and our Find the Connection Round 5 was the moment when the sun finally broke through to rally our teams towards a fantastical finish. 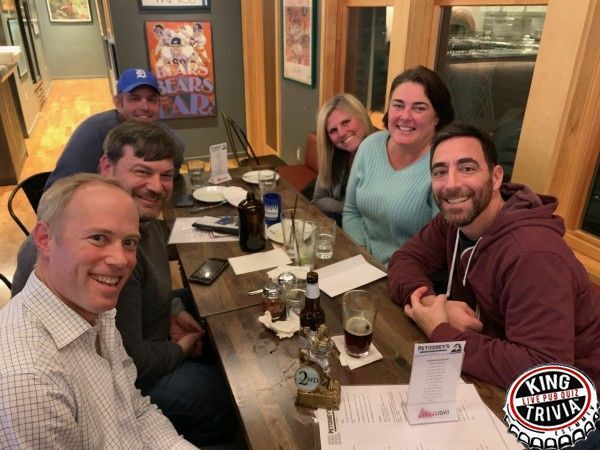 This week's connection took a while for team's to puzzle out, but I greatly enjoyed the joyous moments of apprehension I heard among the tables as teams realized the answers all contained popular horror movie characters. I am curious which answers were the linch-pin for teams to figure it out; was it the general who lead an army of elephants against Rome (Hannibal), the Pokemon character known in Japan as Satoshi (Ash Ketchum), or perhaps the name of Matt Damon's amnesiac assassin (Jason Bourne). The second stage rocket boosters were fully engaged at this point, as Cornstache and Gollum Gollum both Double or Nothing-ed for a sweet 20 points, helping bring our teams' collective average accuracy all the way up to 80%. And if you thought that was impressive, wait until you hear about our Handout Round 6. A welcome reprieve from the rounds of questions that fully stumped our teams, the challenge here was to assign religions to their associated country of origin (ex: Saudi Arabia = Islam, Japan = Shinto, etc). Perhaps we skewed too far in over-correcting though, as every single team had 100% accuracy this round! But that doesn't mean there wasn't any strategy for our teams to consider, as all but two of our teams successfully decided to Double or Nothing, which meant that the race for the podium became a whole lot more interesting. Gollum Gollum's decision not to Double or Nothing in Round 6 come back to bite them, as Corstache used their 20-point windfall to push past and take first place with 63 points against Gollum's 54. Meanwhile, Second Deck used their 20-point tax rebate to solidify a third place position at 48 points. And the caboose of our teams had all made their scores much more respectable, LGBT BBQ was all the way up at 38 points, Future Industries was at 33, and Cabbage Corp was at 29. What are the five freedoms that the 1st Amendment prohibits Congress from abridging? What five US States border Lake Superior, Lake Michigan, or Lake Huron? Although our teams had an average accuracy of 85% this round (the Freedom to Petition and Minnesota were the missing links for most teams), that didn't mean that everyone moved up in the standings. How is that possible you ask? Well, four teams decided to Double or Nothing (Cabbage Corp, LGBT BBQ, Second Deck, and Gollum Gollum) but only one of them ended up succeeding. And for that one team, it was the Play of the Game as Gollum Gollum narrowly stole a First Place finish out from under the nose of Cornstache, 74 points to 71. Second Deck's failed Double or Nothing could have potentially cost them their third place finish at 48 points, but luckily they were far enough ahead to avoid Future Industries' fourth place finish at 41 points, while LGBT BBQ's failed Double or Nothing kept them out of reach back at 38 points and a fifth place finish. Cabbage Corp brought up the rear with their 29 point finish in sixth place, but they received a foamy little beer cozy as a consolation prize. All in all, it was great night with tons of energy and cheerfulness that lifted up the moods of everyone attending despite the difficult start that some of our teams faced. Thanks so much to everyone for coming out and making it an enjoyable evening of food, friends, factoids, and uhh, fermented beverages? That's the only F-word for alcohol I can think of. I hope to see you all again soon, whether on this coming Tuesday or one farther out in the future. Keep on keeping on in the meantime though, peace out!